Euro Motors, the official BMW Group importer in Bahrain, has announced the launch of the 2019 BMW 3 Series Sedan in the kingdom. 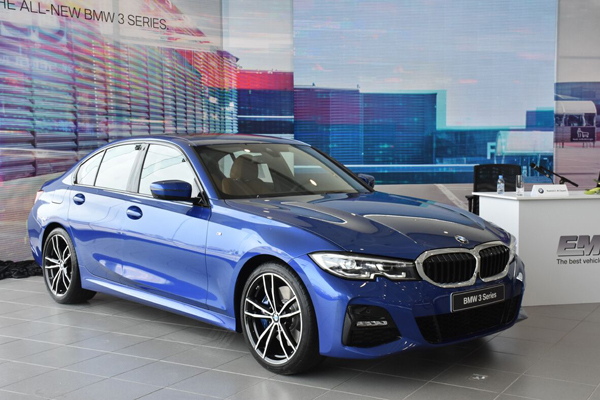 The seventh generation of the successful BMW 3 Series range, the new model is set to dominate the premium mid-size luxury car market, said a company statement. The latest edition to BMW range combines enhanced sporting prowess with a refined interior ambience, eye-catching design and state-of-the-art driver assistance, control, and connectivity technologies. Showcasing sharper driving dynamics thanks to its upgraded chassis, new damper technology, stiffer body structure, low centre of gravity and even 50-50 weight distribution, the new 3 Series Sedan delivers a smooth, high-performance and comfortable experience for both passengers and driver. An expansive range of chassis options adds to the sporting ability and driving performance of the new 3 Series Sedan. These include; lowered M Sport suspension, M Sport brakes, and up to 19-inch light-alloy wheels. The striking design language created for the 2019 BMW 3 Series Sedan helps to expand the classic look of this popular mid-size luxury vehicle while also expressing clear and visible references to the range’s heritage and enduring popularity. The car’s modern aesthetic, sportiness and exciting on-road presence is visible through clear yet rigid design lines that incorporate optimal aerodynamics to help reduce drag along with new features such as an active air flap control, Air Curtains and the completely sealed underbody. Full LED headlights come as standard throughout the range, along with stylishly darkened rear LED lights, with additional extras including Adaptive LED headlights with BMW’s non-dazzling Laserlight technology and optional LED front foglamps. The model features a refined interior, with extensive emphasis placed on driver focus through the positioning of clearly structured controls that help to convey an ambience of exclusive dynamism.